Brosnan entered show business as a teen runaway, working with the circus as a fire eater. He gained somewhat more conventional experience as a member of an experimental London theater workshop before making his stage debut in a 1976 production of Wait Until Dark. Brosnan's theatrical breakthrough came from playwright Tennessee Williams who chose the handsome young actor to create the role of McCabe in the British premiere of his Red Devil Battery Sign. Additional stage work followed before his film debut in a character turn in the well-received Brit gangster film, The Long Good Friday (1981). America first discovered the slender, dark-haired performer on TV in the miniseries The Manions of America (ABC, 1981) as Rory O'Manion, an Irish immigrant who makes it big in 19th century America. This successful exposure lead to his being cast as Steele. Brosnan turned up on a number of specials during the series' run and one failed feature, Nomads (1986), in which he played a bedeviled French anthropologist. The transition to film actor proved difficult, but TV offered regular work in telefilms and miniseries. Brosnan was well cast as urbane eccentric Phineas Fogg in a miniseries adaptation of Jules Verne's novel Around the World in 80 Days (NBC, 1989). He became a familiar face in made-for-cable thrillers, notably playing special agent Mike Graham in Alistair MacLean's Death Train (USA, 1993) and Alistair MacLean's Night Watch (USA, 1995). 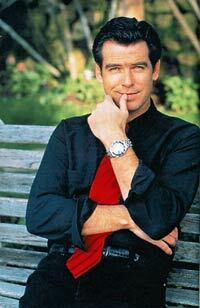 Pierce Brosnan was married to actress Cassandra Harris from the 1970s until her death in 1991 of ovarian cancer. Harris had a unique Bond girl connection having played Countess Lisl in 1981's For Your Eyes Only. 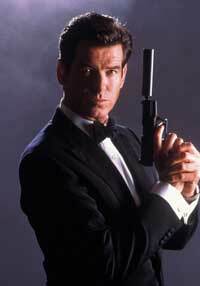 Pierce Brosnan stepped into James Bond's shoes at a time of turmoil and uncertainty. After Licence to Kill was released in 1989, legal issues kept another film from going into production for six years. Timothy Dalton had been released from his contract and the Bond series had been forgotten in the public eye. In the 33 years preceding GoldenEye, the longest hiatus between movies was two years. 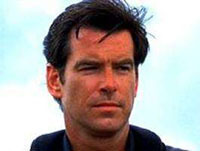 Brosnan had the unique task of not only becoming one of the most loved and revered characters of all time, but essentially saving the series obsolescence. Needless to say, Brosnan hit the ground running and has not looked back since. His movies have all been amongst the most successful of the franchise and have kept Bond alive well into the new millenium. A mix between Connery's Bond and Fleming's, Brosnan brings with him a sense of macho vulnerability that had not been seen since the early 1970's. The audience feels for this Bond because he seems to be human. He has weaknesses both physical (spraining his arm in The World Is Not Enough) and emotional (sitting in his hotel room drinking away his depression in Tomorrow Never Dies). Often hailed as the "second coming of Sean Connery," Brosnan has successfully reinvented the character for a whole new generation. Many people remember fondly seeing Connery light up his first cigarette while saying "Bond, James Bond" in a movie-house in 1962. Well, for millions of people across the globe their first Bond memory will be Pierce Brosnan jumping off a dam in Russia. Either way, Pierce deserves to have Universal Exports' ID card in his pocket.